Dig in to the world of Minecraft like never before! 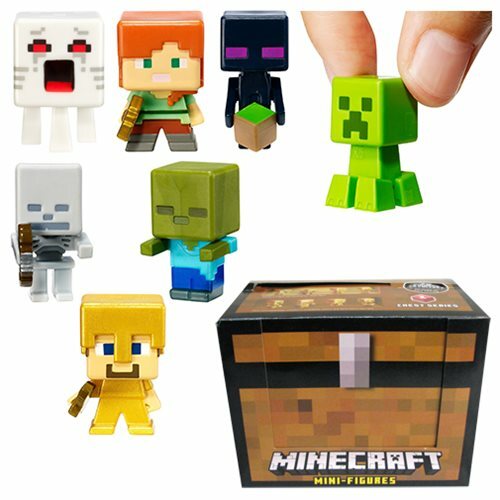 "Buried" inside each chest-themed one-pack is a unique Minecraft mini-figure just waiting to be discovered. Which of your favorite Minecraft characters will you find? You won't know until you open the box! Featuring the game's signature, 8-bit style, these figures allow you to play with your favorite characters anywhere. There are 72 beloved Minecraft mini-figures from series 1 - 6 in this wave, just waiting to become part of your collection, and within the 72 are 8 gold Chase figures! These rare mini-figures are great for collecting and trading with other members of the Minecraft community. Start exploring the world of Minecraft mini-figures today and curate the perfect collection! Each sold separately, subject to availability. Ages 6 and up. The Minecraft Chest Series Mini-Figures Wave 1 Random 6-Pack contains 6 individually packaged randomly picked mini-figures.